This post was first published in December 2015 and has been adapted and reposted January 2019. 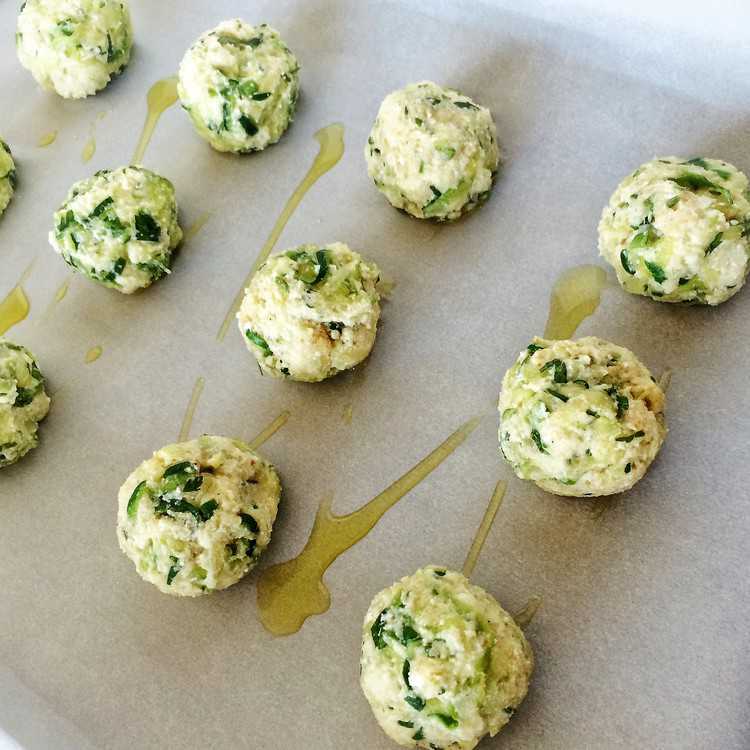 Spiralized Zucchini Ricotta “Meatballs” were inspired by my mother’s meatless meatballs. They’re crisp on the outside and soft on the inside. You won’t miss the meat! My new favorite meatballs have no meat in them at all! After experimenting with my new food spiralizer, I’ve decided that the whole zoodles thing is not for me. They become quite soggy and soft when cooked. Quite frankly no one in my family is convinced that they can replace their beloved pasta! 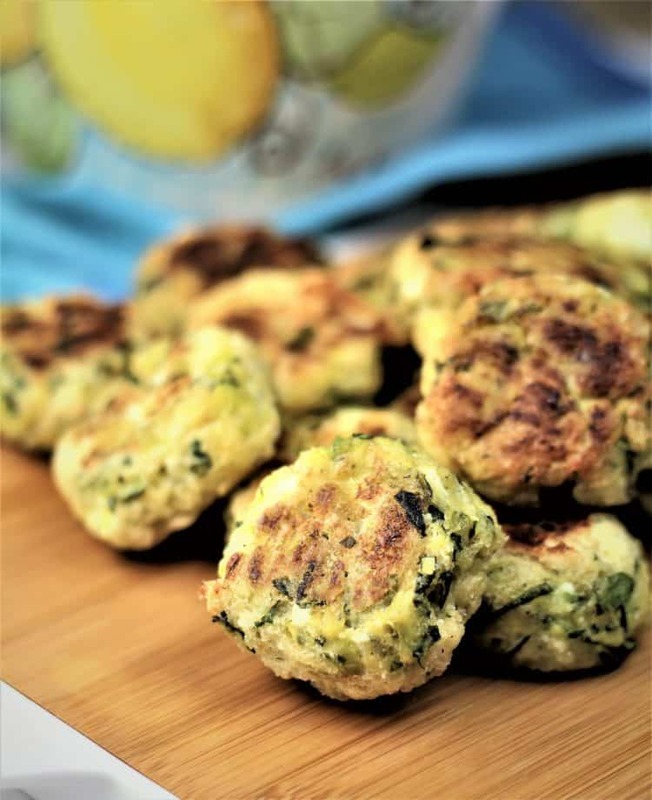 I then created these Spiralized Zucchini Ricotta “Meatballs” and the rest is history! They were inspired by my mom’s famous meatless meatballs. Which reminds, that is another recipe I need to get around to posting! Growing up, we ate a few of my mother’s meatballs straight out of the pan! That’s of course back when she fried her meatballs. This was right before she simmered them in the Sunday tomato sauce. By the way, you can visit my post to get my mother’s traditional meatball recipe. These meatballs our one of our favorite antipasto dishes and quite popular at gatherings. Trust me when I tell you they will disappear in minutes! If you prefer, you can gently simmer them in tomato sauce for about 10 minutes before serving with your favorite pasta. This delicious alternative to traditional meatballs will be loved by vegetarians and non-vegetarians alike! Watch how easy it is to make them! Did I mention how easy these are to prepare? 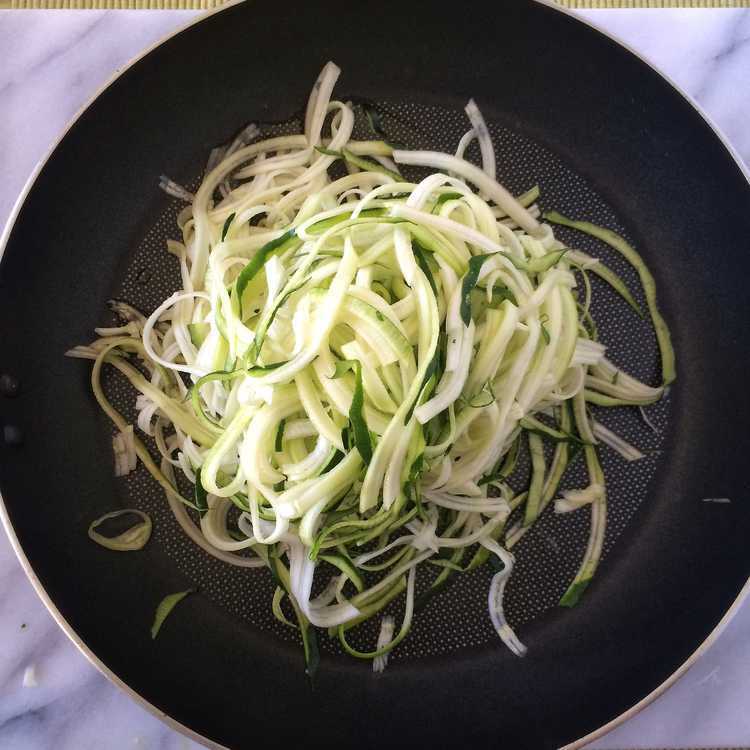 Begin by spiralizing your zucchini. In order to make the zucchini strands easier to handle, give them a rough chop. Sauté the spiralized zucchini strands in olive oil, until soft, about 4 minutes. Do not brown the zucchini. Transfer to a bowl and let cool for a few minutes. Add the remaining ingredients and stir together. Shape into meatballs and bake for 30 minutes, flipping them halfway. In no time you’ll have these lovely golden “meatballs”! The mixture is very soft, this is normal. This will result in meatballs that are crisp on the exterior but quite soft and moist on the inside. 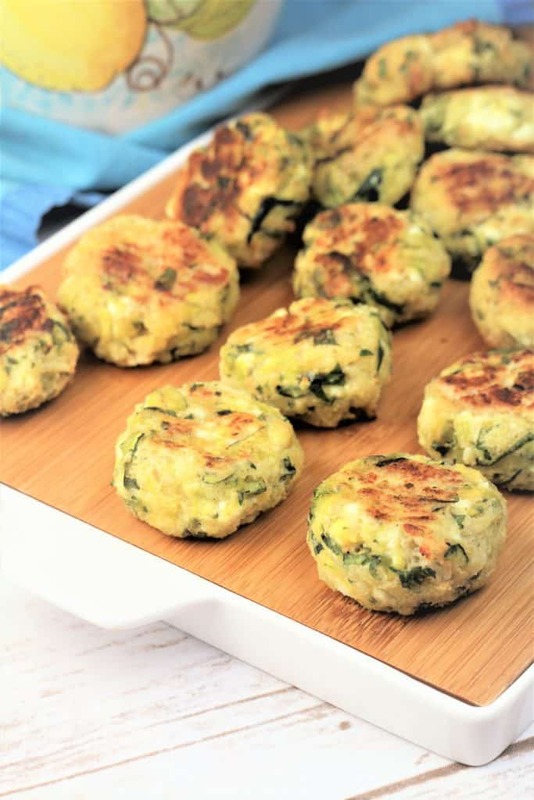 Spiralized Zucchini Ricotta “Meatballs” can be prepare a day ahead and reheated in the oven before serving. Let me know if you’ve tried this recipe by tagging me with your photos with #mangiabedda or @mangiabedda on Instagram and Facebook! Buon appetito! 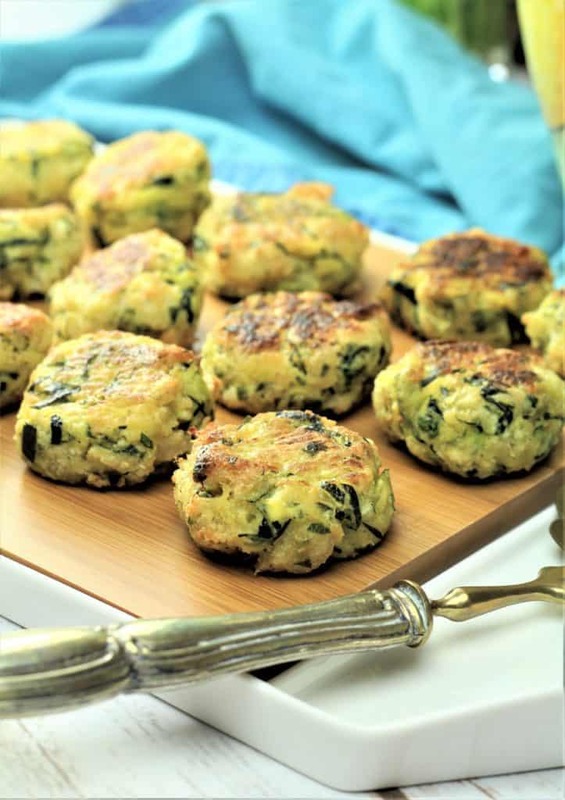 These meatless "meatballs" have become a favourite family antipasto or snack! A perfect vegetarian alternative to meatballs that are soft and cheesy on the inside and crispy on the outside. You'll never miss the meat! Wash zucchini and trim off both ends. 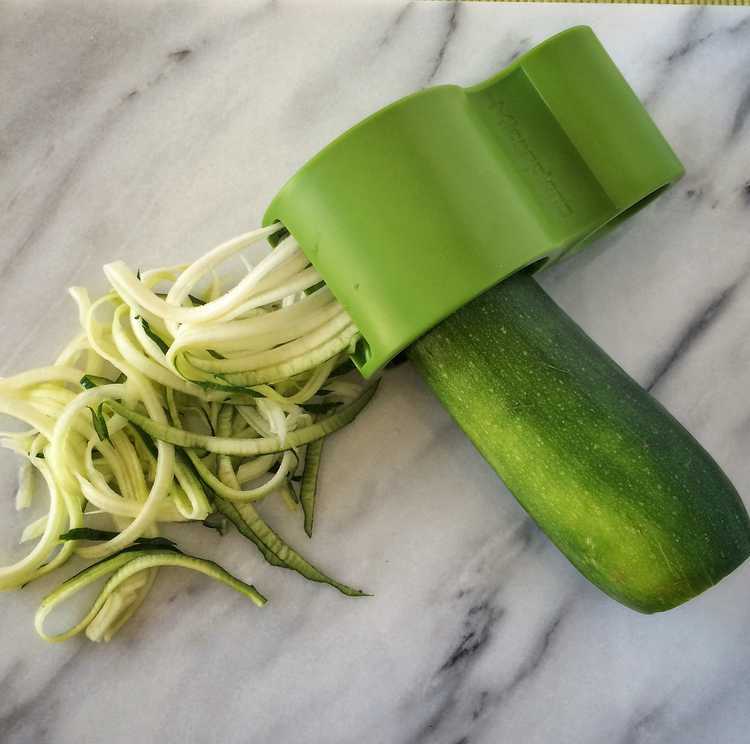 Using a spiralizer, spiralize the zucchini. Give the zucchini strands a rough chop. Heat the olive oil in a large skillet on medium-high heat and sweat the zucchini for about 4 minutes, stirring often, until most of the water has evaporated. Do not brown the zucchini. Add salt and pepper, to taste. Transfer to a bowl and let sit until the zucchini is cool enough to handle. Preheat the oven to 350°F. Line a baking sheet with a lightly oiled sheet of parchment paper. Add the remaining ingredients (breadcrumbs through black pepper) to the bowl with the zucchini. Stir until all ingredients are well combined. Use your hands to shape the mixture into 16 golf ball sized meatballs. Place the meatballs on the prepared baking sheet. Bake for 30 minutes, turning the meatballs half way, until they are browned. Serve hot. The mixture is very soft, this is normal. The result will be meatballs that are crisp on the exterior but quite soft and moist on the inside. 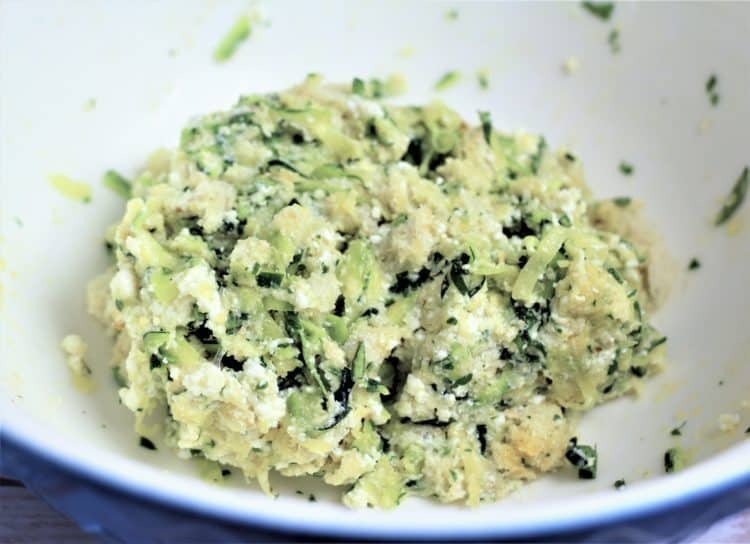 Spiralized Zucchini Ricotta "Meatballs" can be prepare a day ahead and reheated in the oven before serving. Please note that the nutritional information may not be 100% accurate and can vary according to the exact size of your meatballs. Looks fantastic! Love the ingredients and the look. Can't wait to try! OMG, these are delicious and so easy to make! Your recipe worked out perfectly. Thanks! Thanks Pina! I'm so glad they worked well. I haven't met anyone who doesn't like them. They look amazing! Can't wait to make them. 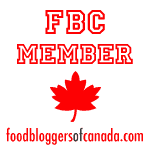 What brand of spiralizer did you use? Thanks Liliana! I used a spiralizer by Microplane but any other will do. Enjoy! Hi Nadia, does the zucchini have to be spiralized? I wonder if I can chop or shred it, since I don't have a spiralizer and want to try this recipe. Hi Teresa, you can also use a cheese grater. I have tried it and it works, however I increased the amount of dried breadcrumbs as they were more moist. Perhaps a couple of extra tablespoons. Thanks for watching! I made these meatballs today and love them! Thank you! I’m so glad to hear you enjoyed them Teresa, thanks for your feedback! Made them , loved them. Thanks! I’m so glad you enjoyed them Tom, thanks so much for your feedback! Hi Margaret, thanks, they are definitely a keeper!